See your target audience clearly: Buy a nuclear medicine email list if you want to grab the detailed contact information of a highly select group of knowledgeable medical professionals. Our nuclear radiologist email list is ready for you to download right now! When you need to reach out to a vast network of doctors who specialize in using some of the most expensive and complicated medical tools and drugs in the industry, make sure you have the accurate contact data that can help you make a great first impression. Our email database of nuclear medicine radiologists is human-verified weekly. It contains all of the data you'd need to comfortably connect: nuclear medicine specialists' emails, fax numbers, phone numbers, addresses, organization information, real names, and more. 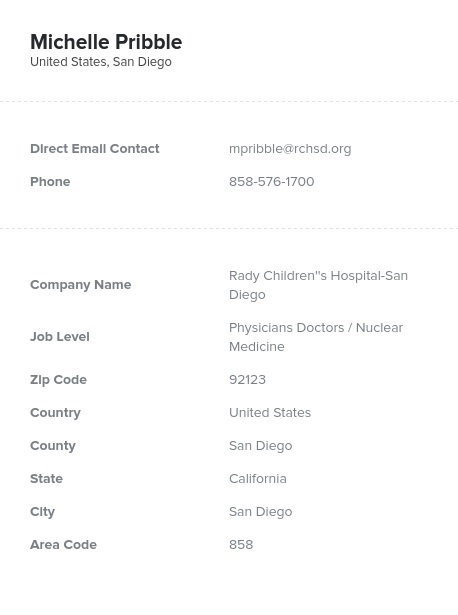 Use this information to call, send mail to, or email nuclear medicine doctors and market to the people who would care about and use your products. Our nuclear medicine mailing list is a great tool for marketing radiopharmaceuticals or for simply networking with a wide array of those in a highly specific, scientific, and specialized field. Many hospitals will have their own doctor of nuclear medicine, who works with a network of other doctors and diagnosticians. These are the doctors who tend to influence other doctors! Because of that, there are quite a few ways to utilize a nuclear physician email database. Help nuclear radiologists heal their patients by telling them about your product or service with the help of our list of nuclear specialist leads. Buy it, download it as a .CSV file, and email physicians who are the experts in nuclear medicine today.